A remarkable newsreel featuring nearly five minutes of game action from Games One and Three of the controversial 1919 World Series is now available online, thanks to the Library and Archives Canada and the Dawson City Museum in Yukon, Canada. The newsreel was originally filmed by British Canadian Pathé News and preserved for decades in an old swimming pool-turned-hockey rink in Dawson City until it was re-discovered in the Canadian national archive this January by Chicago filmmaker Bill Morrison, according to a story last month by the Columbus (Ohio) Dispatch. It is not the first footage available of the 1919 World Series — in which eight members of the Chicago White Sox were banned for intentionally throwing the Series to the Cincinnati Reds — but it is perhaps the highest quality video available of the games on the field. The new film was posted on LibraryArchiveCanada's YouTube page on April 25, 2014, at the request of SABR member Dave Filipi, film/video director of the Wexner Center for the Arts in Columbus. Filipi showed the Pathé newsreel for the first time last month at his annual Rare Baseball Films event. 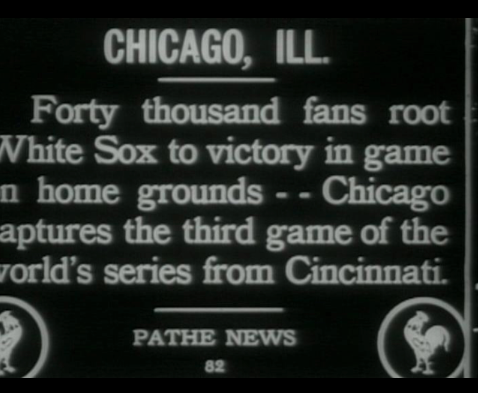 The Pathé newsreel includes never-before-seen footage from the first and fourth innings of Game One of the 1919 World Series, plus an aerial flyover of Redland Field* in Cincinnati and a panorama of the ballplayers in makeshift dugouts, and a shot of fans gathered in New York City to "watch" the game on a mechanical scoreboard. 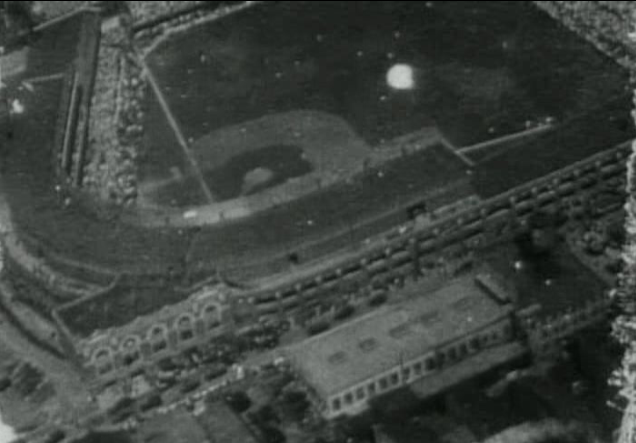 A quick 3-second clip beginning at the 3:06 mark of the video online appears to be one of the most disputed plays of the World Series, one of the plays famously circled by sports writer Hugh Fullerton on his scorecard in the press box: the botched double play ball hit by the Reds' Larry Kopf and fielded by White Sox pitcher Eddie Cicotte in the fourth inning. Cicotte was said to have made "a dazzling play" to field the ball, but Swede Risberg was unable to turn the double play. At full speed, the play doesn't appear to be unusually suspicious and it is impossible to tell with any certainty whether Cicotte's throw to Swede Risberg at second base was too low or too slow, or whether Risberg delayed in making the double-play throw to Chick Gandil at first base. But according to the Chicago Tribune account of the game afterward, the Reds' 5-run rally in that inning "hung on the toenail" of Kopf beating the throw to first. Only one thing is for sure: All three of the White Sox players involved in that play later admitted to receiving bribe money from gamblers to fix the World Series. At the 3:26 mark, a series of successive clips shows the Reds scoring those five runs in the fourth inning of Game One with hard-hit balls to the outfield off Cicotte by Ivy Wingo (3:26), Morrie Rath (3:30), and Jake Daubert (3:35). On the Daubert single, which gave Cincinnati a 6-1 lead and knocked Cicotte out of the game, Gandil makes a lunging catch near the pitcher's mound to cut off Shano Collins' throw from right field. Then the film cuts to a conference at the mound where Cicotte is about to be yanked by manager Kid Gleason. This new film is one of many exciting discoveries related to the 1919 World Series and the Black Sox Scandal that have come to light in recent years and helped to fundamentally change our understanding of "baseball's darkest hour." To learn more about new developments with the Black Sox Scandal, consider joining SABR's Black Sox Scandal Research Committee. JACOB POMRENKE is the chair of SABR's Black Sox Scandal Research Committee and the Web Content Editor/Producer for SABR.org. He can be contacted at jpomrenke@sabr.org or find him on Twitter at @buckweaver. * Correction: This article originally stated the aerial flyover was of Comiskey Park, but SABR member Bob Frazier pointed out that it is actually Redland Field, later renamed Crosley Field. This page was last updated March 30, 2016 at 11:11 pm MST.